I have started a tradition with Sweet Baby. 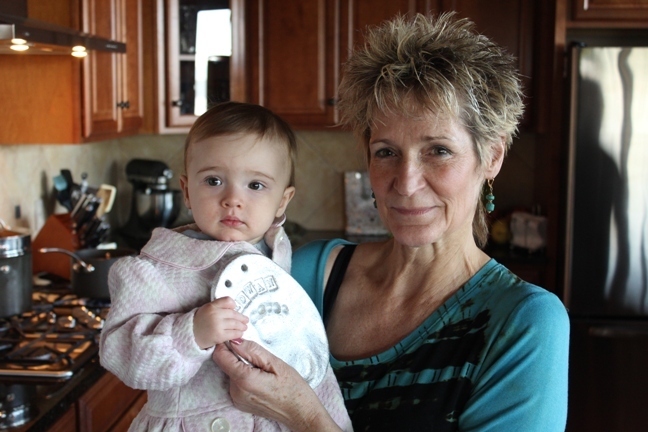 I hope to make an ornament with her/of her every year as she grows. Last year I used a large clear glass ornament, stamped her foot on some pretty paper with gold paint, and once dry, I very craftily slipped the foot into the ornament and straightened it all out. I wrote on the outside of the ornament with a paint pen. This year I wanted to press her foot into some salt dough. 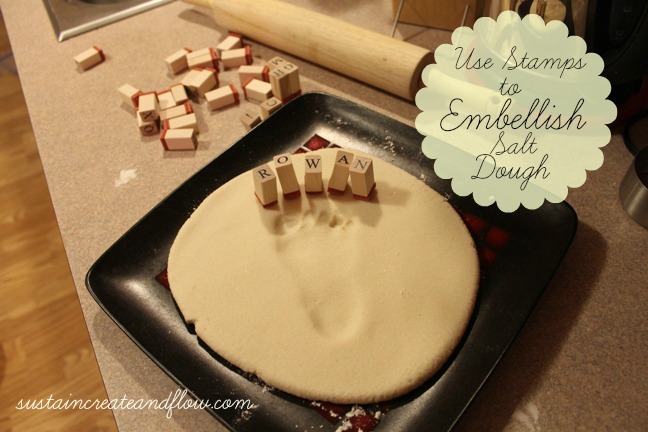 Thankfully, the salt dough recipe is one of the easiest around. My how her little feet have grown! She wasn’t really very fond of this activity, and it’s too bad DH wasn’t home to get the photos of me starting over numerous times and muttering curse words under my breath. (Yep, that’s how my crafts are going right now with my 16 month old– don’t judge). Salt dough crafts are something lodged deep in my memory bank. Dredging those memories up reminds me of elementary school, and how I picked green to shellac that sweet little hand print in because that was my mama’s favorite color. 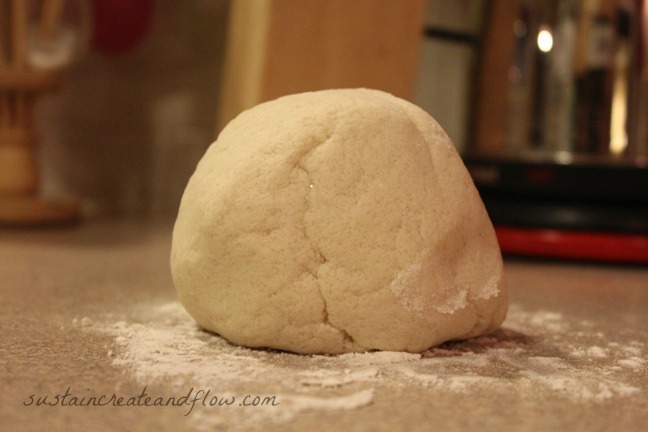 Next, flour your surface and rolling pin, and roll out to approximately 1/2 inch thick. Embellish it as you wish. I used alphabet stamps to write my baby’s name and they looked fantastic! 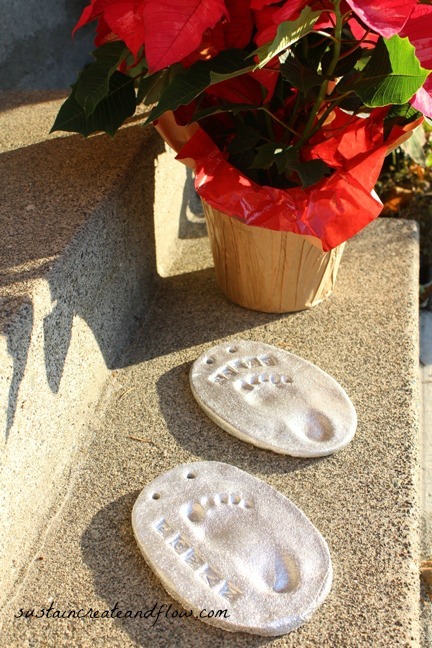 Make sure to poke a hole or two at the top of your keepsake if you intend for it to hang. A straw works well for this task. Using a cookie sheet, bake on wax or parchment paper at 200 degrees F for 2-3 hours depending on the thickness of your ornament and your oven. *Note: My dough appeared done, and then once it had cooled slightly and I lifted it off the pan, the underside revealed that it wasn’t done. I flipped it over and baked it a few hours longer. Keep baking at very low temp until it is good and dry. Looking back, I might have been better off using my Excalibur dehydrator, but that is an idea to try some other day… Regardless, the point is to dry the salt dough out slowly with out heating it too high for it to crack. Once your dough is dry and completely cooled, you can paint it to your liking. I used a metallic spray paint , and the results were awesome! I used a paint pen to embellish the back of the ornament with love notes, dates, etc. 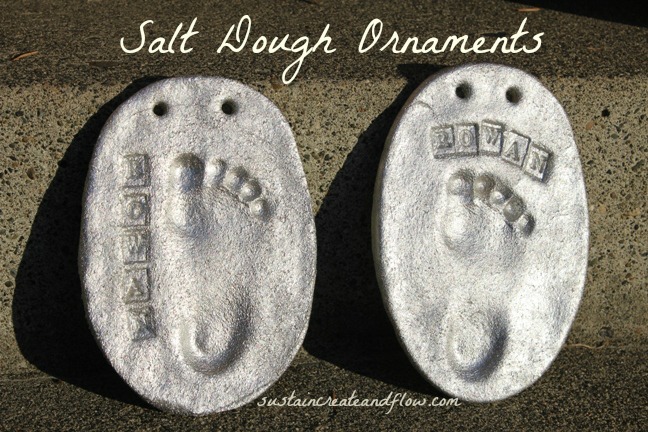 Have you made salt dough or remember playing with it as a child? Or do you use it to make art and embellish your tree with it? Share your tips and tricks in the comments with us. That is so odd, Leanne! Mine are still good as new after several years now… Maybe apply another coat to shine it up a bit? I don’t have any other ideas as to why. Science. It’s hard.